Ramble on. After releasing the Rover and opening the door for people who never thought they'd enjoy cycling again, we found many customers wanted more. So that's just what we gave them. The Rambler has the same high seat and straight-forward frame geometry as the Rover, but with many upgrades for riders who want to go faster and farther. It features a sleek Y-frame design which improves the Rambler's handling and stability. It is available with up to 30 speeds, and is about eight pounds lighter than the Rover. What really sets the Rambler apart, however, is the feel of the ride. It responds beautifully through corners and the lightweight chro-moly steel frame ensures a smooth ride. For tackling those off road riding adventures, the Rambler All Road is ready to take you beyond the paved trails and then back again.The Rambler is designed to do it all without sacrificing comfort or ease of use. Its range of options and component levels make it the perfect platform to create a trike for your specific needs. The Rambler is as versatile as it is stylish. It is available in three different component levels: n380 NuVinci, x16, and x30. 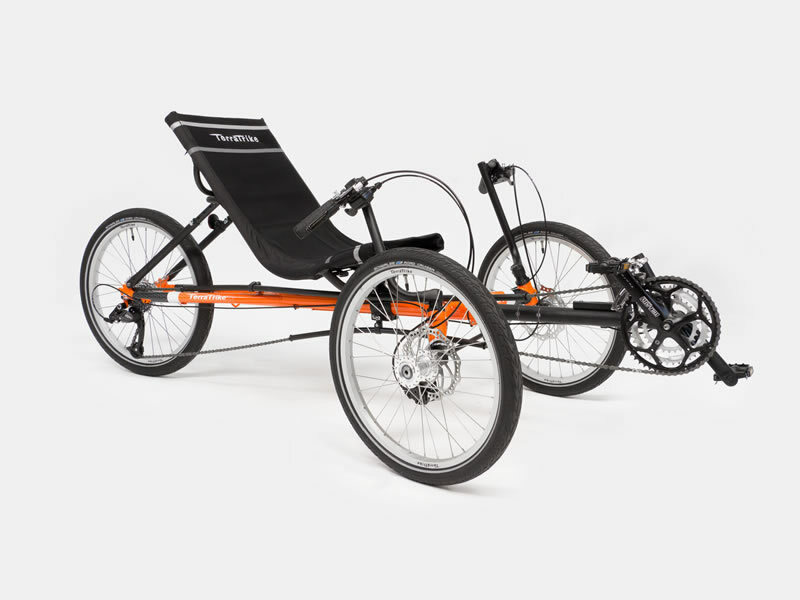 The single-piece frame made of round chro-moly steel tubing also gives the Rambler a nimble, responsive ride.The seat mesh is breathable and is fitted across a lightweight aluminum seat frame. Along with standard disc brakes and full seat adjustability, the Rambler is a quality machine for casual and serious riders alike. The frame comes in a stunning Tangerine Orange or Arctic White finish (x30 level only) with complimenting graphics.